Because of the reduced attention to nausea and vomiting occurring after surgical anesthesia, this epidemiologic survey was designed to evaluate the present incidence of PONV for different types of common surgical procedures at Tripoli Medical Center, Tripoli, Libya. This study was designated as a prospective interview-based investigation of the occurrence of PONV. To attain an illustrative sample of everyday surgery, we collected records from 170 patients attending several types of surgical procedures in different operating theaters: general surgery, gynecological, orthopedics, and ophthalmological at Tripoli Medical Center, Tripoli, Libya. Enrollment and interviewing of patients were conducted from the beginning from November 2017 to April 2018. This study was approved by the Committee of Faculty of Medical technology, Tripoli University, Libya. Inpatients arranged to undergo elective surgery from one of the surgical procedures requiring anesthesia (general or regional) and follow-up for the first 2 h in the recovery room were enrolled in this study. Patients from both genders but pregnant patients and those requiring management in the intensive care unit were not included in the study. All patients during the study who met the inclusion criteria entered the study, and patient consent was obtained. Anesthesia staff instructed to use the usual anesthesia technique and postanesthetic care. All relevant data recorded in the data collection were analyzed using Microsoft Excel 2013 and SPSS version 22. 0 (SPSS Inc., Chicago, IL). Descriptive statistics (such as frequencies and percentages) were used to analyze the data. Comparing the incidences of PONV with different surgical procedures were analyzed using the ANOVA test. Data comparison between PONV prevalence and anesthesia techniques was done using Student's t-test. Questioners and interviews were completed for 170 patients, of whom, 108 (63.5%) were female. The distribution of the inpatient within the four surgical departments and different procedures is shown in [Table 1]. [Table 2] presents demographic characteristics of the patients for different types of surgery and anesthesia. The anesthetic technique was general in 152 (89.4%) patients and 18 (10.6%) was regional anesthesia (RA). In RA groups, the proportion of female was greater than general anesthesia (GA) group (134 vs. 94), in which the patients were generally younger. Other characteristics in both anesthesia groups were quite similar. Male and female patients were equally similar with regard to age and preoperative condition, apart from some difference in the following assumed prognostic factors for PONV; the proportions of female with PONV after the previous general and RA were 47% and 12%, respectively, and those of male 26% and 8%, respectively; 23% of males were regular smokers. Each patient received intraoperative opioids (fentanyl in most cases). Enhancement boluses of fentanyl were given as required. Postoperative pain was treated with intramuscular or intravenous opioid (tramadol) in 60% of patients and with epidural opioids in 19% of patients. Opioids were used less after otolaryngology operations than after other types of surgery and less after regional than GA [Table 2]. Further, 31% of all patients received only nonsteroidal anti-inflammatory drugs for pain relief. During the first 2 h after surgery, nausea was experienced by 28.2% of all patients and 22.3% vomited. Significantly, the highest incidence of nausea was reported in gynecology patients, of whom 62.5% were treated with antiemetic medication [Table 3] (P < 0.05). During the second observation period from 2 to 24 h postoperatively, the proportions of patients with nausea and vomiting in the whole population were 32.3% and 25.8%, respectively. 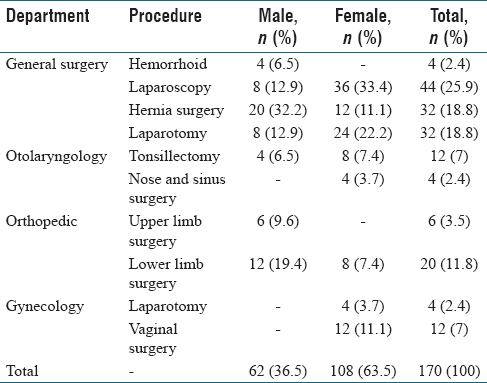 Again, the rates were significantly higher in the gynecology patients (nausea – 68.7% and vomiting – 50%), followed by orthopedic surgery patients [Table 3]. Vomiting was treated with antiemetics more often than nausea only. 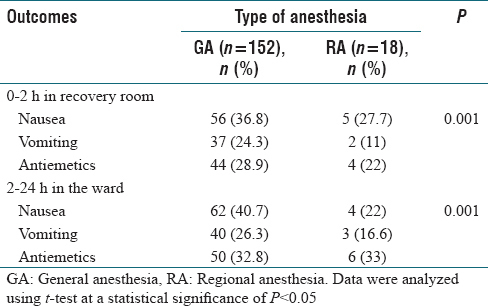 Nausea, in the recovery room, was more common after GA compared with RA (36.8% and 27.7%, respectively, P < 0.05) [Table 3]. Similarly, in the ward, the incidence of nausea was higher in GA than regional technique (40.7% and 22%, respectively). Female patients suffered more from nausea than male patients. The incidence of vomiting both, in the recovery room and on the ward, was higher in GA than regional one (24.3% and 26.3% in GA and 11% and 16.6% in RA, respectively, P < 0.05) [Table 4]. Again, female patients were suffered from vomiting more than male patients. This survey was conducted to examine the occurrence of PONV. PONV remains one of the most frequent anesthesia-related problems, touching about 30% of patients after surgery, and with an frequency reaching up to 80% in high-risk patients., The main cause of PONV remains blurred but includes anesthetic and surgical influences. In addition to patient dissatisfaction, PONV may also lead to more serious complications, such as adverse surgical consequences. Our survey is upgraded our awareness of postoperative complication and increased the possibility of recognizing patients at risk for PONV, using a small number of simple individual characteristics. Furthermore, this survey is clinically important for prophylaxis and treatment of the two symptoms and possibly will influence how upcoming efforts in this area are done. We are grateful for all the anesthesiologist, anesthesia technician, and students elaborated in this study. Hines S, Steels E, Chang A, Gibbons K. Aromatherapy for treatment of postoperative nausea and vomiting. Cochrane Database Syst Rev 2018;3:CD007598. Kovac AL. Prevention and treatment of postoperative nausea and vomiting. Drugs 2000;59:213-43. Watcha MF. Postoperative nausea and emesis. Anesthesiol Clin North America 2002;20:709-22. Matthews C. A review of nausea and vomiting in the anaesthetic and post anaesthetic environment. J Perioper Pract 2017;27:224-7. Koivuranta M, Läärä E, Snåre L, Alahuhta S. A survey of postoperative nausea and vomiting. Anaesthesia 1997;52:443-9. Bhakta P, Ghosh BR, Singh U, Govind PS, Gupta A, Kapoor KS, et al. Incidence of postoperative nausea and vomiting following gynecological laparoscopy: A comparison of standard anesthetic technique and propofol infusion. Acta Anaesthesiol Taiwan 2016;54:108-13. Bayter M, Peña P, Marquez M, Cárdenas-Camarena L, Macias A, Rubio J, et al. Incidence of postoperative nausea and vomiting when total intravenous anaesthesia is the primary anaesthetic in the ambulatory patient population. Ambul Surg 2018;24:8-11. Smith HS, Smith EJ, Smith BR. Postoperative nausea and vomiting. Ann Palliat Med 2012;1:94-102. Kwak KH. PONV prevention: Still not enough. Korean J Anesthesiol 2017;70:489-90. Shaikh SI, Nagarekha D, Hegade G, Marutheesh M. Postoperative nausea and vomiting: A simple yet complex problem. Anesth Essays Res 2016;10:388-96. Golembiewski J, Chernin E, Chopra T. Prevention and treatment of postoperative nausea and vomiting. Am J Health Syst Pharm 2005;62:1247-60. Palazzo MG, Strunin L. Anaesthesia and emesis. I: Etiology. Can Anaesth Soc J 1984;31:178-87. Dobbeleir M, De Coster J, Coucke W, Politis C. Postoperative nausea and vomiting after oral and maxillofacial surgery: A prospective study. Int J Oral Maxillofac Surg 2018;47:721-5. Sizemore D, Grose B. Postoperative Nausea. In: StatPearls. Treasure Island (FL): StatPearls Publishing; 2018. Available from: https://www.ncbi.nlm.nih.gov/books/NBK500029/. [Last accessed on 2018 Jun 08]. Camu F, Lauwers MH, Verbessem D. Incidence and aetiology of postoperative nausea and vomiting. Eur J Anaesthesiol Suppl 1992;6:25-31. Myles P, Hunt J, Moloney J. Postoperative “minor” complications: Comparison between men and women. Anaesthesia 1997;52:300-6. Champion S, Zieger L, Hemery C. Prophylaxis of postoperative nausea and vomiting after cardiac surgery in high-risk patients: A randomized controlled study. Ann Card Anaesth 2018;21:8-14. Pierre S, Whelan R. Nausea and vomiting after surgery. Contin Educ Anaesth Crit Care Pain 2013;13:28-32. Carpenter RL, Caplan RA, Brown DL, Stephenson C, Wu R. Incidence and risk factors for side effects of spinal anesthesia. Anesthesiology 1992;76:906-16. Haigh CG, Kaplan LA, Durham JM, Dupeyron JP, Harmer M, Kenny GN. Nausea and vomiting after gynaecological surgery: A meta-analysis of factors affecting their incidence. Br J Anaesth 1993;71:517-22.